Home > Natural Remedies > How Much Do You Know About Fibre? Fibre is often one of those elusive nutrients that we hear about but don't give much thought to when it comes to making healthy choices in our diets. In fact, for some it's an ignored aspect of eating until they experience digestive difficulties, at which time their doctor may then suggest monitoring fibre intake to ensure a healthy digestive system. If you haven't given much thought to the fibre content of your diet, then now is a good time to start – especially before any problems begin to occur from insufficient fibre intake. Take a look at some of the statements on fibre and see how much you know about this important part of your diet! Then, ask yourself if these statements are true or false. You can read on to find out more about the fibre in your diet. In turn, you will hopefully make better food choices. Actually, all whole grain foods are not created equal. The best way to find out how much fibre is in a food is to read the label. While you might not be used to reading labels, now is the time to start if you truly want to get an accurate sense of how much fibre you are consuming each day. Also keep in mind that whole grain may refer to a mix of grains whereas whole-wheat choices tend to have higher fibre content. But beware again because not all whole-wheat foods are 100 percent whole-wheat. Some may be a mix of white and whole-wheat, so again, ensure you read labels. Ideally, aim for a bread that has a minimum of two grams of fibre per average slice; you will find that some can have double this amount as well, so be diligent and keep reading labels to find one that has adequate fibre and tastes good. While it's true that a person who eats a diet high in fruits and vegetables as well as whole-wheat products is likely to be getting enough fibre each day, it's not a definite and resounding 'yes.' Many healthy foods are still low in fibre. The key is to eat a wide range of foods and ensure you're getting enough servings of fruits and vegetables each day. It's still important to read labels and get a better sense of just where your diet sits in terms of fibre content each day. Your fruit and vegetable servings may also be smaller than you think as well. Actually, the opposite is true. 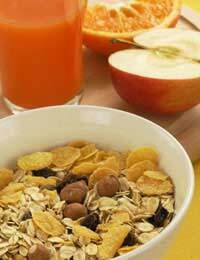 Fibre is an important part of any weight-loss plan. It helps keep you feeling fuller for longer and can thus keep you from overeating. In fact, a fibre-rich breakfast is a great way to start your day off right, by helping to control appetite throughout the day and prevent excessive eating later on in the day, particularly in the evening. The fullness is a positive result rather than an indication of any weight gain. Just be sure to drink adequate fluids during the day, which will ensure your body can handle a good intake of fibre. This statement is often, but not always, true. Most people who find that their digestion is problem-free and have regular, comfortable bowel habits, are more likely to have a healthy intake of fibre than those who suffer from digestive and bowel problems. There is much disagreement on what constitutes healthy bowel habits. Some of the more alternative health publications and books support the idea that a person should have as many as three bowel movements each day, but this is not based on evidence. What is concerning is if you notice a change in what is your normal, healthy bowel pattern. So, if you have one a day and feel good, then not to worry! But, if you find you are suddenly becoming constipated, take a look at your diet and see if you've made any recent changes to fibre or fluid intake. While most of us don't get enough fibre, increasing intake will tend to bring benefits. However, eating enormous amounts of fibre can still be detrimental to your digestion and health. Fibre can bind up nutrients, so a very high intake can mean that you lose valuable nutrients from your diet. Most people in the United Kingdom (UK) don't get enough fibre. In fact, the average person consumes only 12 grams of fibre a day, rather than the recommended 18 grams. A diet rich in fibre can prevent you from becoming constipated while also promoting healthy, long-term benefits such as lower cholesterol and blood glucose as well as helping you to reach and maintain a healthy body weight. Make sure that you know the facts about fibre and resolve to eat a varied diet that is rich in fibre. Your health will be thankful from your good choices and you can enjoy your foods and the benefits they provide.